Dropbox is an online file-hosting service that allows you to safely and easily store your files on cloud servers where you can access them from any modern device that is connected to the internet. 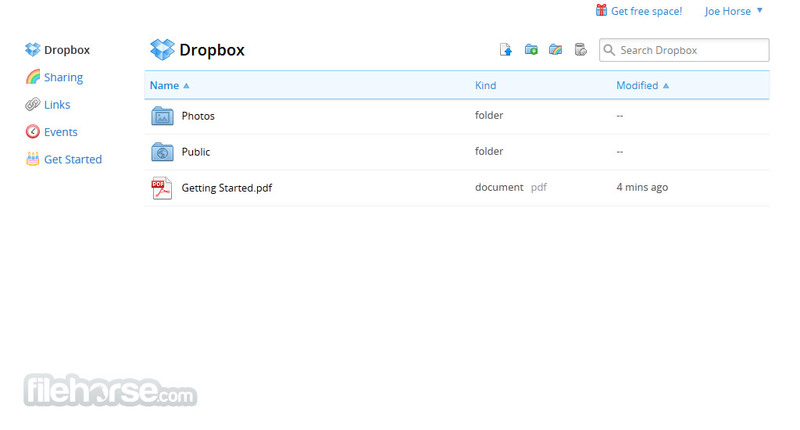 Dropbox is a perfect solution for storing files that need to be accesses from multiple devices, and computers with different operating systtems. Working with it is easy, just go to Dropbox site and use its web interface to upload files of any kind, directories, pictures, videos and anything you want. 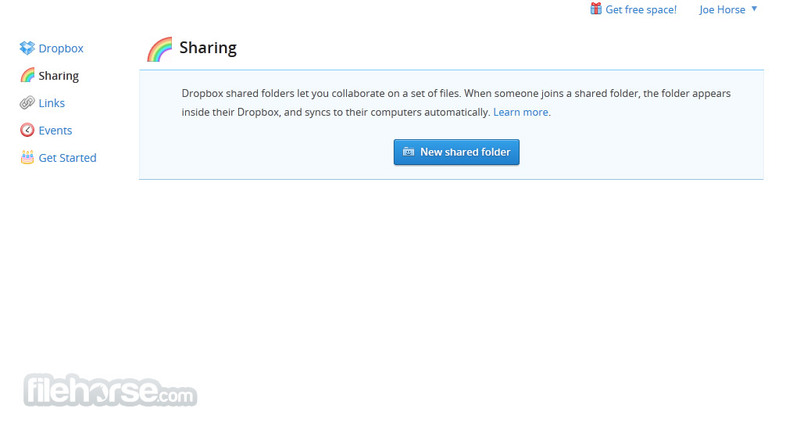 Dropbox can also monitor versions of files you have uploaded, and help you to recover previous versions of those files. That way, truly nothing of your work will ever be lost, even if you have overwritten it. Free online file hosting! With millions of satisfied users all around the world, Dropbox represent one of the best and most reliable file-hosting services in the current online world. Give it a try. Why limit yourself with the local storage of your files, precious documents, important credential and your work data when you know that in any moment disaster may happen any time. Faced between risky proposition of safeguarding your files on your local drive (risk of theft, fire, accidental deletion, drive failure), many developers decided to create easy to you cloud services that will enable everyone to solve all the problems of local storage and in the meantime introduce several new features that are responsible for significant improvement of user experience, ease of use, and the way we share files online. 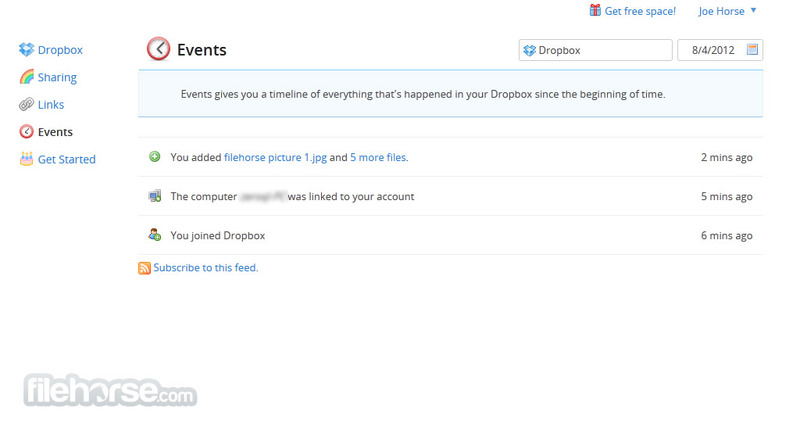 Dropbox, the most popular cloud based storage service in the world, was first who showcased to the world how free online file storage and sharing can help more than 100 millionusers to keep track of their files in one centralized place that can be accessed from any modern internet enabled computing device. As one of the pioneers in the area of multiplatform cloud-powered file hosting service, Dropbox enables everyone to create free 2GB account that can be used for storage and file synchronization. No matter from where you access Dropbox account (PC or Mac browser, dedicated applications on Android and iOS), you will always have access to your files. This cloud storage sharing is elevated to the higher level if you install PC and Mac client, which enables you to create local copy of your cloud files on your PC. This way, whenever you change something in your local Dropbox folders, those changes will immediately be sent to the cloud. Additionally, if you have selected to share some directories with your friends, family or co-workers, all those changes will be immediately sent to them. This enables you to fully take advantage from online collaboration, instantly share files between all your computers, and generally makes managing of identical files on multiple computers much more easier (as soon you edit file on one computer, that change is distributed to all of them). Free online file hosting! Interface of Drobox web service is easy to understand and streamlined so that anyone can use it. Mix of stylish white and blue designs hosts file manager, tools for simple file editing (copying, moving, deleting, sharing), and some file-types can be previewed directly from web interface (for example pictures). PC client interface is also simple to use. After installing small client and connecting it to your Dropbox Free online file hosting! credentials, a new icon will appear in taskbar, enabling you to quickly see the status of your account, access to preferences, syncing options, and your local Dropbox directories (which will open in a traditional Windows Explorer view, enabling you to manage them however you want). Dropbox has managed to attract such a large audience by offering free tier of service for users on all supported platforms (Windows, Mac OS, Linux, iOS, Android, and few others). Everyone with a brand new account is given 2 GB of free online storage, but that can be expanded in several ways. Subscription of $10 per month will expand your storage to 50GB, $20 tier gives you 100 GB, and a special “Team” option for more serious online collaboration gives you 350 GB of online space. If even that is not enough for you, you can contact Dropbox customer support to find out what rates you can get for larger storage capacity that will be appropriate to your needs.Please take note that you can expand your storage by few hundred megabytes if you take advantage from integrated promotion tools that are offered by Dropbox. Registration process for Dropbox is very easy. Just provide your email address and desired password in the signup area and in seconds you will be ready to start using you online storage. Dropbox has managed to revolutionize sharing of files between devices, which is a feature that many regular web users can appreciate. As one of the leading programs in this field, Dropbox continues to grow with each day, managing to surpass the competition with its simplicity and wide reach.